In this blog, three Cochrane Review authors share the latest evidence on dressings and topical agents for pressure ulcers. Using a technique (network meta-analysis) to compare each treatment with every other in the trials, are we any further forward in making informed choices about which to use? We set out to answer this question by doing a systematic review and meta-analysis of the evidence on dressings and topical agents for healing pressure ulcers. The result is a Cochrane Review, which has been published recently. We think we have done a good review – but it is dealing with poor quality evidence, and because of that, there is a lot of uncertainty about the results. There are many dressing and topical treatments for pressure ulcers, with variation within those treatments, e.g. dressings for wounds with different levels of exudate. Some of these treatments have been investigated in trials over the past 30-40 years, but we don’t know which treatments are the best in terms of wound healing. Clinical guidelines (e.g. NICE in the UK) have recommended that saline gauze should not be used as a treatment for pressure ulcers, but do not give guidance regarding which, if any, dressing or topical agent might be most effective. It’s a confusing picture that is not really helped by looking at the evidence from individual trials. Firstly trials are often small and conclusions are vague. Secondly although it is useful to some extent to learn that dressing 1 is more likely to heal a pressure ulcer than dressing 2, and dressing 3 is better than dressing 4, etc, how do we decide which is the best overall? This is particularly difficult when not all these dressings have been compared with each other in trials. 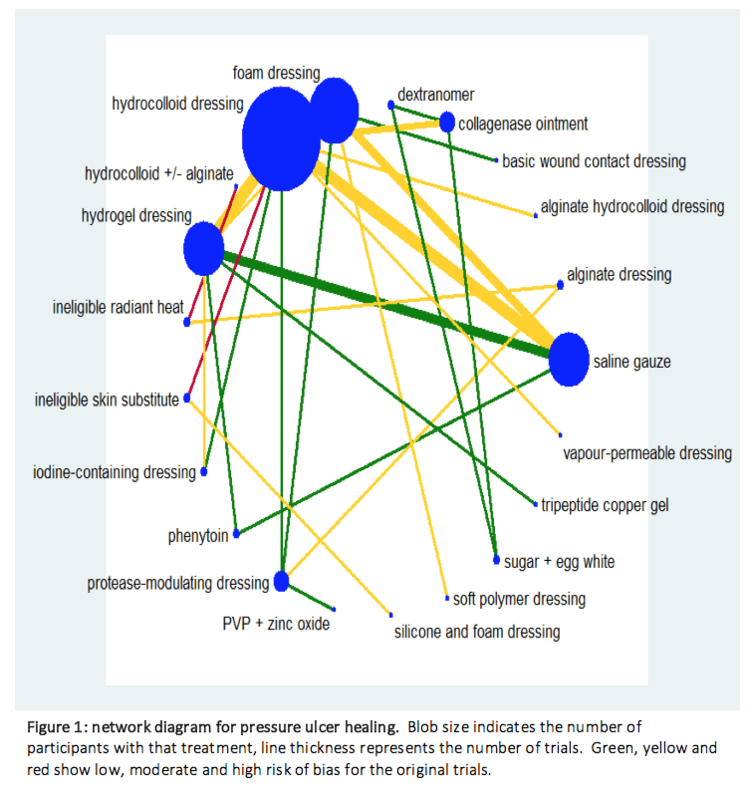 In order to deal with this confusing array of evidence about dressings and topical agents, we used network meta-analysis: this allows us to combine the results of multiple trials comparing different treatments, forming a network linked by common comparators. The value of this approach is that it maintains the randomisation of the original trials but allows us to compare treatments indirectly that have not been compared directly in trials. As with standard meta-analysis, a number of assumptions must be met, especially around the meaningful pooling of data from studies with potentially different study populations and approaches. The NMA process allows us to compare each treatment with every other in the network, and has the added benefit of providing a ranked order of treatments in the network in terms of the treatment most likely to be the best (for the given outcome), followed by the next best and so on. As with other evidence synthesis, it is also important to assess the quality (or the certainty of the evidence) in a network meta-analysis. This can be done using a modified version of the GRADE approach. We found 51 randomized trials, and 39 could be linked to form a network joining 21 treatments in about 3000 participants (see the network diagram below, which shows the evidence from trials). There were 13 different dressings and 6 topical agents and 2 other linking interventions (we only included topical agents that could be left on the wound, so not washes or irrigating fluids). We got results for 210 comparisons covering every pair of treatments and were also able to obtain the rank order of treatments (along with probabilities that each treatment is the best, the next best, and so on). To make interpretation easier, we focused on the results for the 20 comparisons with saline gauze, and the rank order of all the treatments in the network for healing. What does NMA tell us that we didn’t know before? Unfortunately, nearly all of the evidence was low or very low quality – and that was mainly because many of the original trials were poorly conducted and, in the network, there weren’t many participants for the number of treatments considered. Low quality means we only have limited confidence in the overall effect (result): ‘the true effect may be substantially different from the estimate of the effect’ (Balshelm, 2011). ‘Very low quality’ loosely translates as ‘we can’t trust the results’. 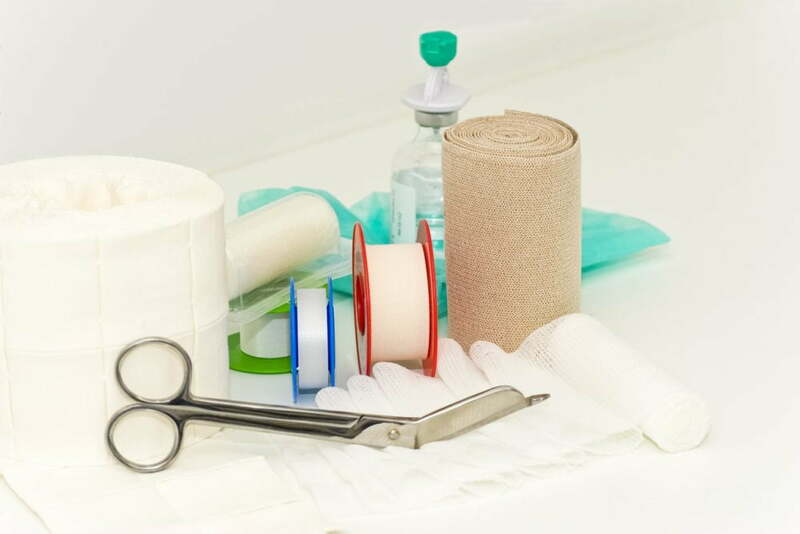 Consequently, we are unable to determine which dressings or topical agents are the most likely to heal pressure ulcers, and it is mostly unclear whether the treatments examined are more effective than saline gauze (which, in the trials, had a median healing rate of 150 per 1000). What we can say is that protease-modulating dressings, foam dressings or collagenase ointment may be better at healing than gauze; but even this evidence is not certain enough to be an adequate guide for treatment choices. Further information for all the comparisons is in the review. The very low quality of the evidence as a whole means we can’t give meaningful information on which treatment had the probability of being best, that is, to rank the treatments. Now, having uncertain evidence is all very well in academic research – it just means we need more research. But how does it help nurses to make decisions today (not in 2, 5, 10 years’ time)? If they want to know about which treatment to use, then what do they do? How do we all deal with uncertainty? When there is uncertainty, we believe it is important for nurses to have the evidence to hand as a basis for decision making, being fully aware of its limitations, and using their clinical judgment about the different treatments to consolidate (or reject) the uncertain evidence described here. It is important also to bring in other factors (ease of use, cost, patient preference, etc). We need to work with, rather than independently of, the evidence. If the evidence quality had been better, the review would probably have informed updates of guidelines. What we can say is that this extensive Cochrane Review does not contradict the NICE 2014 guideline recommendations, which are (for adults): not to use saline gauze (in the UK), and – for other dressings – to discuss with adults the type of dressing, taking into account pain and tolerance, position of the ulcer, amount of exudate and frequency of dressing change. It would have been good to have some definitive answers to the questions – but we can’t make a silk purse out of a sow’s ear. Instead, we all have to do the best we can with what we’ve got. The evidence is pretty poor, but, in partnership with clinical experience and discussion with the patient, it can become much more valuable. Join in the conversation on Twitter with @CochraneUK @CochraneWounds #EENursing or leave a comment on the blog. Disclosure of interest: Dr Westby discloses a grant from NIHR (UK) and reports her work on the 2014 NICE clinical guideline on pressure ulcers. Dr. Dumville discloses a grant from NIHR (UK). Dr. Norman reports grants from NIHR (UK), during the conduct of the study. Maggie Westby is a methodologist and systematic reviewer, with a liking for complex reviews. Maggie trained as a research chemist and switched to Evidence Based Health Care around 15 years ago, learning systematic reviewing/methodology at the UK Cochrane Centre. She then worked for 10 years on NICE clinical guidelines based at the Royal College of Nursing, returning to the academic world in September 2014, working on complex reviews with the Cochrane Wounds Group at the University of Manchester.